Leslie Roberts, Your Photographs Must Be, 2015, acrylic, gouache, graphite, ink, colored pencil, on gessoed panel, 14 x 11 inches. Contributed by Marjorie Welish / American artists may over-esteem the vernacular as the only true democratic mode. But occasionally a vernacular mythopoesis really inspires a good body of art. 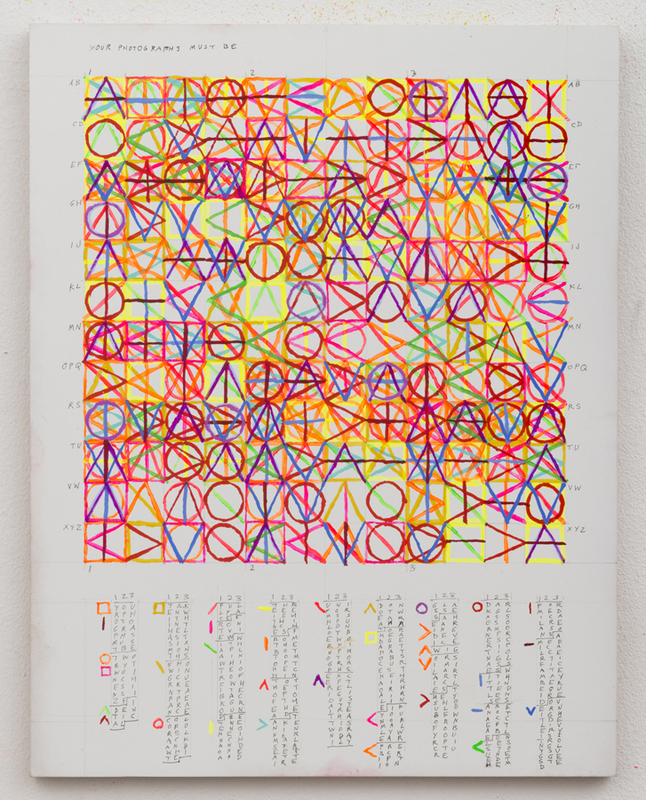 Leslie Roberts is a scavenger of found lexicons—code-able idioms in daily use on commonplace themes. 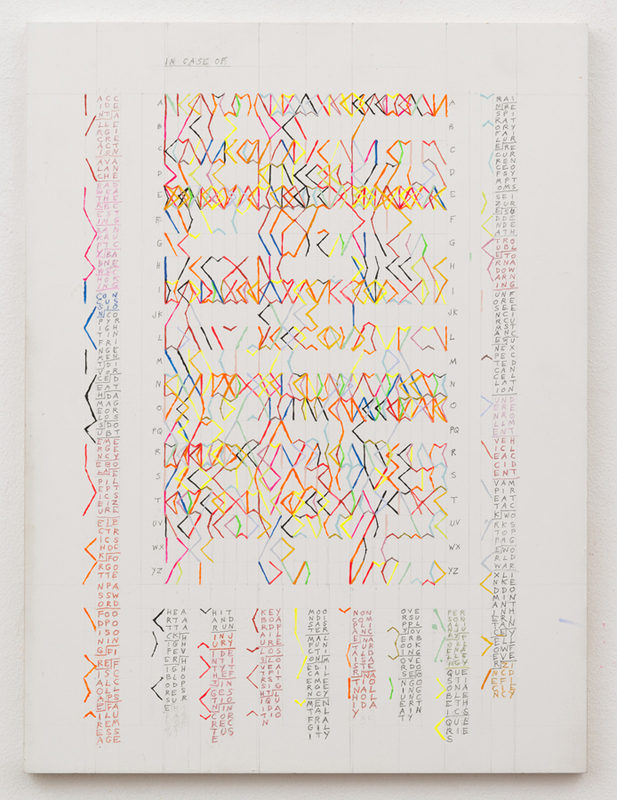 From such source data she transcribes letters into colored graphic marks, then charts these across and down a grid. 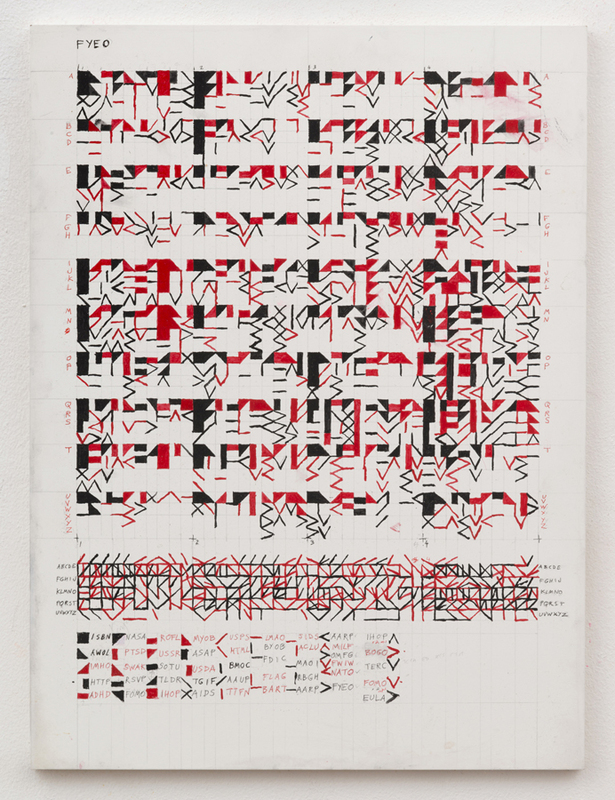 At Minus Space we now see the work: that is, the method as a whole coexisting with the singular brilliantly colorful result, in small panels requiring reading as well as seeing. In Case Of begins with this lexicon: accident, allergic reaction, avalanche; C to A and B registers phrases by way of a commuter’s world: wet paint, alien nation, call ticket master, etc. ; FYEO culls anagrams we take for granted. It is a pleasure to report that here is no pedantry: rather, all is a refreshing take on a ‘Seventies procedural formalism indifferent to taste. Leslie Roberts, In Case Of, 2016, acrylic, gouache, graphite, ink, colored pencil, on gessoed panel, 16 x 12 inches. 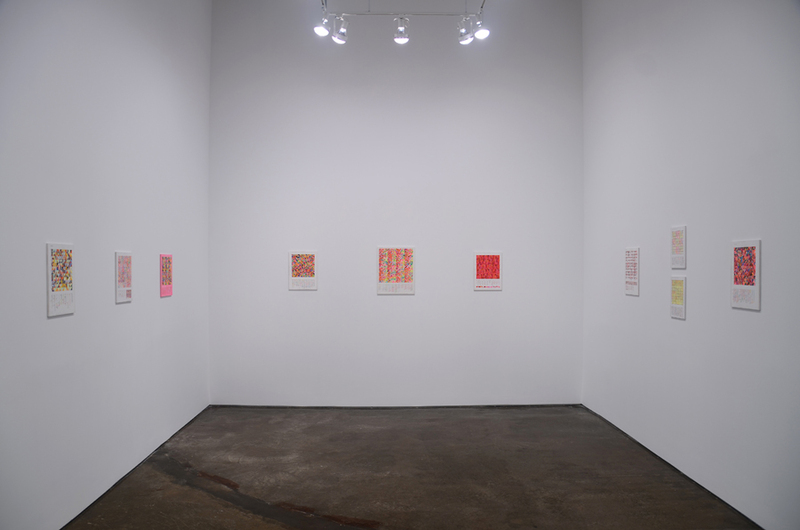 Leslie Roberts at Minus Space, installation view. “Leslie Roberts: FYEO,” Minus Space, DUMBO, Brooklyn, NY. Through October 29, 2016. About the author: Painter and art critic Marjorie Welish has received many grants and fellowships, including the Adolph and Esther Gottlieb Foundation, Elizabeth Foundation for the Arts, The Fifth Floor Foundation, Guggenheim Foundation Fellowship, Pollock-Krasner Foundation, and Trust for Mutual Understanding (supporting an exchange between the International Studio Program, New York and the Artists’ Museum, Łódź, Poland). In November, she has a solo show opening at ART 3 Gallery in Bushwick. brief, straightforward notes on Works by Leslie Roberts at Minus Space; with excellent photography of exemplary works and mounted Exhibition appropriate to this Show and mission of Minus Space. About Ms Roberts abstract-color-system constructed works, semiotic bits/icon fragment based, Welish uses terms “..vernacular mythopoesis..”. She mentions correctly “..work as method..”; which may be fundamental to aesthetic of Minus Space ‘process-orientated’ Shows. Images show entire Works with bright colors, including small notes/drawings at bottom of each, detailing systems. Expository conclusion “..refreshing take..seventies procedural formalism indifferent to taste.” Fine, perceptually demanding, Exhibit – equally fine review/notes.